What Is the Connection between Passover and Tu B’Shvat? Tu b’Shvat is an ancient celebration of the new year for trees. 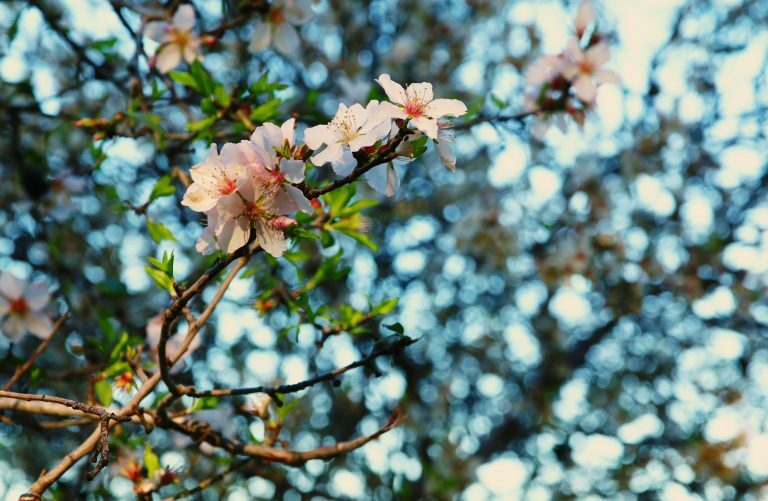 It takes place in the midst of winter in the United States, as we anticipate the coming of Spring and the first blossoms in the Land of Israel. Passover celebrates the Story of Exodus, rebirth, and marks the beginning of Spring. Celebrating Passover with a Seder is a time-honored tradition. However, a custom currently enjoying a revival is the creation and celebration of a Tu B’Shvat Seder. This ritual was developed in the 16th century by the Kabbalists (Jewish Mystics) in the town of Safed in Northern Israel. As with the Pesach Seder, it is highlighted by the drinking of four cups of wine, with a difference: each cup represents a different season. The first cup is traditionally white wine representing Winter, the second white with a few drops of red for Spring, the third a mix red and white for Summer, and the fourth mostly red for the Fall. It is also customary to eat four groups of fruit at various points during the Seder, each group is connected with a different realm or rung of existence — physical, emotional, intellectual, and spiritual. Unlike the Pesach Haggadah, the liturgy for Tu Bishvat is less developed and codified, hence there is greater space for the creative organization of this festive celebration. Here is a link to the Jewish environmental organization Hazon, which includes a variety of Tu b’Shvat resources and many texts and teachings on Judaism and the earth.